The Joint Council of Fire and Emergency Services along with the Division of State Fire Marshal are proud to announce the addition of engraved pavers to the Florida Fallen Firefighter Memorial in Ocala. You can now purchase granite or brick pavers to be placed in the Memorial courtyard surrounding the "Firefighter at Rest" monument. Firefighters, family members, friends, and fire and emergency service organizations will be able to personalize their remembrance or message in stone. Engraved Granite Plaque - 8" x 16"
There also will be a very limited number of spaces for larger plaques on a wall facing the Memorial. These plaques can have a fire department's logo in color and names of departed members (not necessarily LoDD), or other remembrance. All funds will be used to enhance and maintain the perpetuity of the Florida Fallen Firefighter Memorial honoring the firefighters who made the ultimate sacrifice. 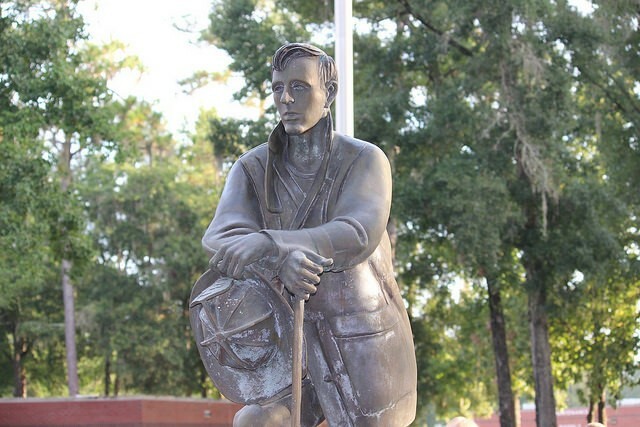 The Florida Fallen Firefighter Memorial was dedicated on January 11, 1992, and occupies a place of honor at the center of the Florida State Fire College campus. The Florida Joint Council of Fire and Emergency Services and the staff of the FSFC maintain the memorial in perpetuity. given their lives so that others might live.